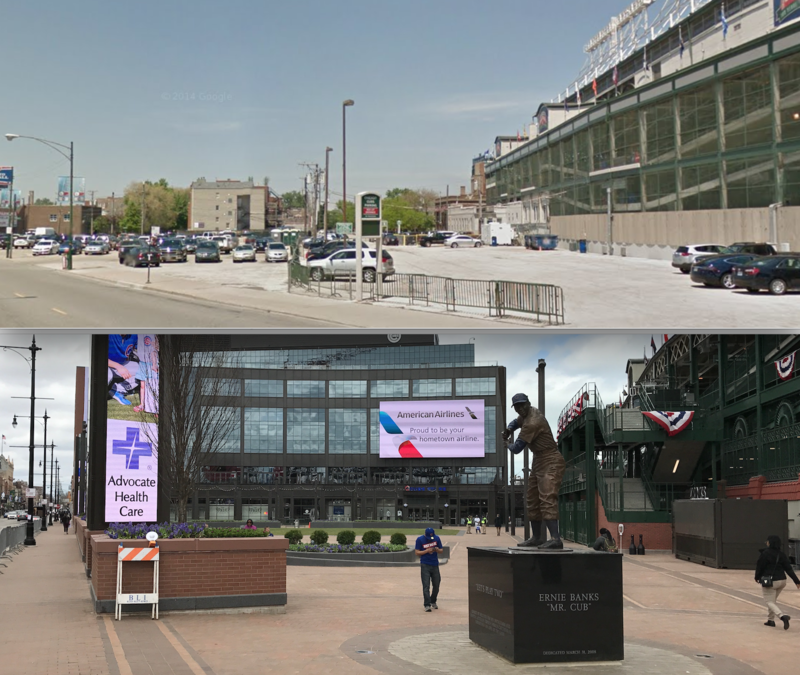 For better or for worse, Wrigleyville is changing rapidly as Wrigley Field undergoes a continuing makeover, and a seven-story hotel and a huge mixed-used development are constructed next to the ballpark. The stadium’s walkable, bikeable, transit-friendly location, surrounded by retail, has always been a huge asset, especially in comparison with Sox Park, which is surrounded by a moat of parking lots. The addition of dense retail, apartments, and hotel rooms near Wrigley should help make the community more vibrant, if it can be done without pricing out mom-and-pop businesses or making existing neighborhood housing less affordable. But one major drawback of all the new development is the addition of several hundred new off-street car parking spaces to the Addison and Clark intersection, located a stone’s throw from the local Red Line station, which will make the area more car-centric. Encouraging residents and shoppers to bring vehicles into Wrigleyville, rather than building parking-lite transit-oriented development, is only going to worsen street congestion. On the plus side, there have been some smart urban planning decisions. This year the city is experimenting with “surge-priced” parking, doubling the rate for metered parking near the ballpark from $2 to $4 an hour during games and concerts. That will encourage attendees to consider alternatives to driving to Wrigleyville, as well as improve parking turnover, which will mean less cruising for spaces by those who do drive. Another very positive development is the transformation of the surface parking lot on the west side of the stadium to the Park at Wrigley to a plaza and lawn that will function as public space for all Chicagoans when there aren’t events at the stadium. Although there were originally plans to replace the lot with a parking garage, four years ago the Ricketts family, which purchased the Cubs and ballpark in 2009, proposed the much wiser option of a community gathering place. The space will host a farmers market and outdoor movies during the summer, and a skating rink during the winter. The park includes a large natural-turf lawn, pavers, planters, and bleacher-like seating. There’s also a new building at the north side of the property that includes Cubs administrative offices, retail, a café, and an upcoming tavern named in honor of legendary sportscaster Jack Brickhouse. During events at the stadium, the Park at Wrigley will only be open to ticket holders, but at most other times it will be available for public enjoyment. An outdoor firm series co-hosted by the nearby Music Box Theater kicks off on June 14, and in mid-June a branch the Green City Market farmers market will debut. Think how much beneficial this new public space will be for the community, as well as for city coffers, thanks to sales tax revenue, than the land would have been if it remained a place for warehousing automobiles. with aging two story buildings.